× Welcome to the CPL Aerodynamics question and answer forum. Please feel free to post your questions but more importantly also suggest answers for your forum colleagues. Bob himself or one of the other tutors will get to your question as soon as we can. The other thing that I am sure has something to do with it is motion vs relative motion as once an aircraft is in a state of climbing then the motion becomes relative I guess. When we talk about the balance between forces, we are considering ALL of the forces acting. When an aircraft is in a climb, the forces acting to lift it are BOTH thrust and lift - not just lift alone. The forces acting to resist the climb are BOTH weight and drag, not just weight alone. The combined effect of lift and thrust (the resultant, R2) is exactly balanced by the combined effect (the resultant R1) of weight an drag. The sum total of all of the forces cancels out and there is no 'left over' force. In fact, in a climb lift is actually LESS than weight and thrust is GREATER than drag. It's the resultants that cancel out. (R1 is exactly equal and opposite to R2). See also page 89 of the Aerodynamics book. Last Edit: 1 year 5 months ago by bobtait. I don't have a copy of Bob's text so my comments are generic rather than specific to his document. Plus all moments (or torques, if you prefer) are balanced. The result is that the body under consideration doesn't accelerate (ie maintains its speed and direction) nor does it turn or tumble. ALL the forces have to be resolved into components (either horizontal and vertical as in the sketch or along and perpendicular to the flight path) and the various components added to see what results. If the two sets of forces all balance out, then the forces are said to be in equilibrium and the aircraft will continue along on its merry way at the same speed. All motion is measured relative to some observer's position. This may be on the aircraft, from the ground, from another aircraft .. whatever. I think you have gone off on a tangent somewhere with this one ? Perhaps if you ask some follow up questions we can sort the problem out progressively. I see that Bob beat me to the punch with his answer. .
Last Edit: 1 year 5 months ago by John.Heddles. You should also keep in mind that many theory texts leave the student with the idea that lift and drag are produced by the wings alone, as though we are considering a wind tunnel test. 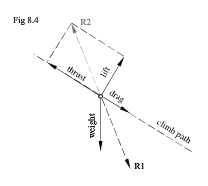 If you are going to create a vector diagram showing lift, drag, thrust and weight acting on an actual aircraft in flight, you would have to define lift as the component of all of the aerodynamic forces acting over the entire surface area of the aircraft that acts at right angles to the direction of motion. Also, drag would have to be defined as the component of all of the aerodynamic forces acting over the entire surface area of the aircraft that acts opposite to the direction of motion. Too often we see diagrams that suggest that lift and drag and centre of pressure are related only to the wing. That's only true in a wind tunnel.